The "Table" content element allows to provide data as "comma separated values (CSV)", a plain text form of storing tabular data (numbers and text). This form is often used to move tabular data between two programs that natively operate on incompatible (often proprietary and/or undocumented) formats, like Microsoft Office Excel. These programs often provide CSV as an export method. Each line in the field Table content represents a row in the table. Columns are separated by a field delimiter, which can be configured with the corresponding field. 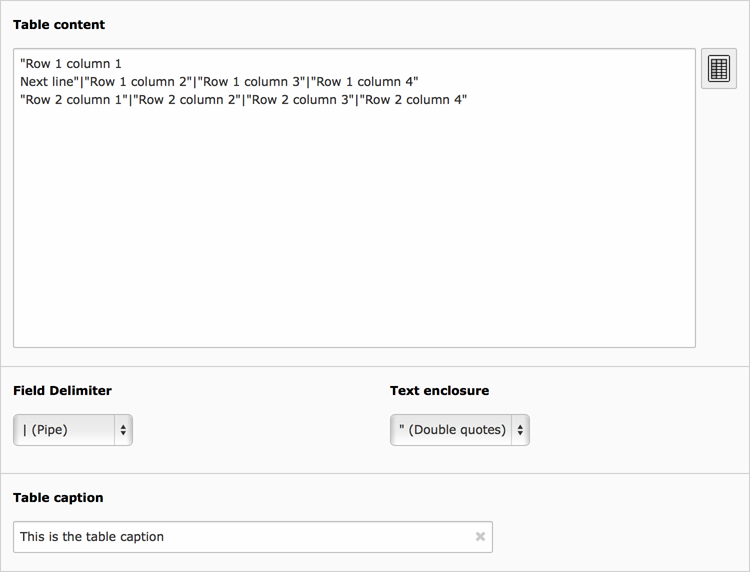 Columns can be enclosed by a character, configured in the field Text enclosure. This is especially helpful when you want to have newlines within a column. By default the Field delimiter is a vertical bar "|", the Text enclosure set to none. A Table caption can be provided as a heading for the table. The maximum amount of columns. Even when more columns are defined in the Table content field, the table will only show the maximum amount of columns. The first row or the first column can be used as a table header. The last row will be used to group the table’s footer area (which may be a summary, an addition of column values, or some call to action based on the preceding content). Frontend output, showing the different options of "Table header position"